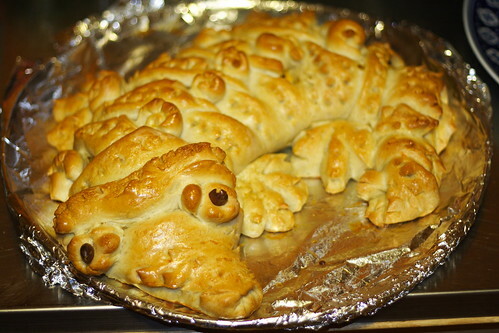 Five years ago in the Bulgarian forum I'm visiting from time to time a lady posted for the first time the recipe for this "crocodile" and soon pretty much everyone I knew tried the recipe. Now don't get me wrong- I don't mind the recipe being popular...but it it was quite quite overwhelming feeling to see the damn lizard everywhere you go, so out of pure stubbornness I decided not to make it. 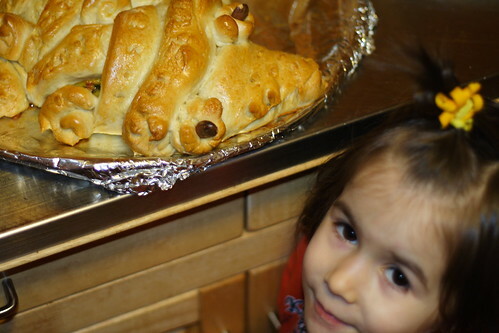 Yesterday, my own mom told me that even she had tried that recipe ( and she doesn't even read that forum) and while we were talking my daughter overheard that Grammy is baking a crocodile. You can only imagine the storm of questions about the size, taste etc of the crocodile and since then I was asked to bake it every 5 minutes. So, I decided to give it a try and to my surprise it came out really well. I don't usually like stuffed "breads" because they tend to be somewhat undercooked around the stuffing, but this one was nothing like that. 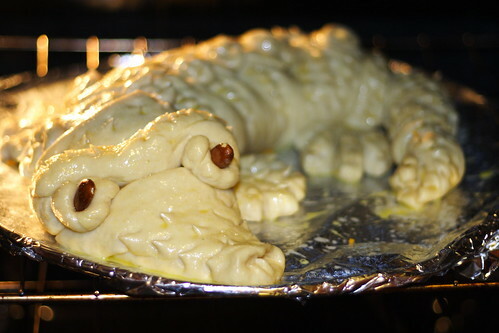 Just to be fare to the sources I used for the recipe, I saw the "Crocodile" for the first time in BG-Mamma( recipe in Bulgarian) and then saw the link to the original source in Russian. The wonderful Russian lady posted step-by-step pictures how to make it so I decided there is no need for me to do that again. Even if you don't speak the language it's pretty obvious what you do, but I will share the dough recipe I used, since there is a little bit of difference between the original recipe and mine. You know how I like to change things in the recipes I use, so here it goes. I let my trusted friend Zojirushi Breadmaker knead the dough ( not that I can't do it by hand, but seriously, who wants to waste time with that when you have a machine for it ) and after 45 minutes the dough was ready. There is absolutely no problem to knead the same dough by hand if you don't have a breadmaker, it will probably take longer to rise though, if it's not so warm in your home. You can use virtually anything, just keep in mind that you have to keep the moisture coming out of the filling to a minimum. What does this mean? Well, if you want to use vegetables, stir fry them first, if you are using any kind of canned produce, let it drain well before you use it. 1. Make the dough by hand or with a breadmaker . 2. In the mean time in a large skillet stir fry all the fresh ingredients ( in my case leeks), combine all the ingredients together and set aside. 3. Preheat the oven at 350F. 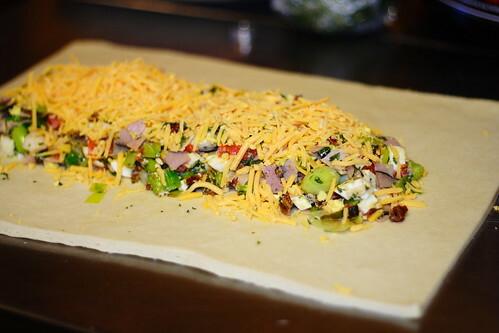 After the dough is ready, roll out a large sheet, cut the sides so it's rectangular and spread filling in the middle. 4. 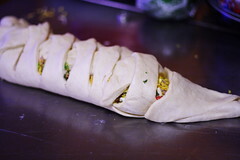 Take a look at the step by step instruction how to cut the sides and fold them together. 5. 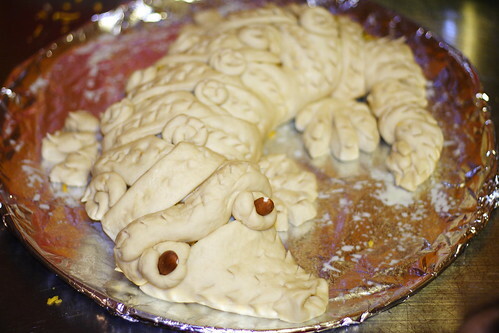 With a pair of cooking scissors (or any kind of scissors for that matter) make the decorative cuts on the "crocodile". You can use almonds, olives or anything you like for the eyes. 6. 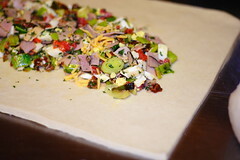 Place on a greased cookie sheet or any kind of flat pan ( like pizza pan) and brush with egg yolk. Sorry, no way out mate! 7. Bake in the oven for 40 min or until golden brown on top. When ready let it cool for at least 15-20 min before cutting. In the pan out of the oven, resting. 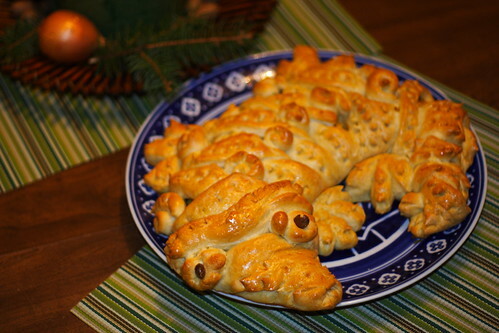 I don't see a reason why you can't make the same thing with sweet filling and here are also other ideas for different shapes- tortoise and porcupines. 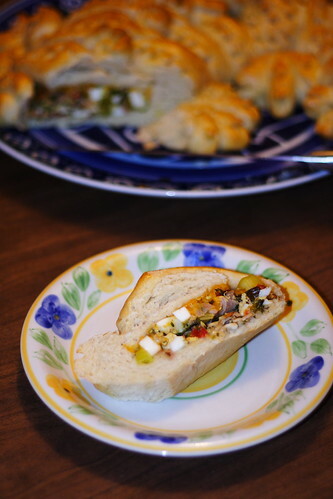 I hope you like this recipe that is both effective and very delicious! 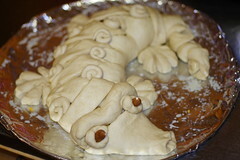 The kids had a blast eating the "crocodile". The croc is a very cute idea. I love the filling as well. OH man that must have taken ages to make! Very impressive. That's what I thought before I tried the recipe, Muishkas. On the contrary, it didn't take as much time as I initially predicted, especially since the breadmaker kneaded the dough. 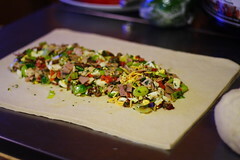 I would say 45 min for the breadmaker to make the dough and 15 min to shape it ( I consider that in the 45 min the dough is baking you can cut and stir fry the filling), then 40 min to bake. So total 45+15+40= 1h 40 min.